Photo by Valerie Terranova Photography. To go or not to go? If that is the question of this review, New Yorkers looking to escape the pendulum swing happening between seasons outside right now should get themselves inside to The Center at West Park where Hamlet Isn’t Dead’s “Hamlet” captivates and excites. Producing their namesake and the Bard’s most cerebral of plays, the company of Hamlet Isn’t Dead is truly in their element here, gliding through the work with the expertly nippy pace of a thriller movie, less suited to a dreary depressing Dane and more suited to Liam Neeson hunting for familial revenge. In a play easily weighed down by the fame and bulk of Shakespeare’s writing, this production finds instead the honest urgency and heartbreak between family and friends forced into awful circumstances. James Rightmyer Jr’s deft direction moves the characters through familiar actions with a refreshing breath, creating a “Hamlet” that feels fresh and urgent in a time where political families’ internal squabbles seem relevant as ever. The twist of the production is that they have not one, but two top-tier actors alternating the roles of Hamlet and Ophelia on different performances. Immediately upon entering the intimate blackbox, this reviewer was greeted with gusto from an unassuming David Andrew Laws and Megan Greener, dressed head to toe in suave black garb, but otherwise not noticeably in character. They just genuinely want you to have a good time. Such invitation into the tiny physical playing space of the world they are about to inhabit for two hours is needed and welcome, as the cleverly created stage has “on-stage seating” in the form of two pockets of seats on either side of a thrust runway. Between that and the flowing wine most patrons purchased at the donations bar, the integration into this Denmark was superb and gentle, as the Hamlet Isn’t Dead trademark live music swirled in the background, mixing contemporary songs with a folksy twinge befitting of a sort-of steampunk Elizabethan tone that captured the whole night. As for the two leads themselves, opening night beheld Megan Greener as a divine, earth-rumbling Hamlet. Usually wary of gender-swaps, this reviewer found Greener to fully embody a refreshing, delightful Hamlet, devoid of any character or textual changes that lessened this iconic, brooding, and explosive Dane. In fact, seeing Hamlet as an identifying woman lent a new power to their progression from depression to mania, coupled with complex relationships to both their parents and also to their lover. It is unfortunately all too rare to see female characters with such a range of human emotion and motive on stage, and Greener’s provocative, nuanced performance made me furious Hamlet was not originally written for her. Further to this point, the traditionally fatherly role of Polonius is played with superb comedic superfluity by Rachel Black Spaulding, sputtering and pontificating in a newfound motherly love. David Andrew Laws, the dexterous counterpart to Greener’s Hamlet/Ophelia, plays a subdued, altogether unnoteworthy Ophelia. The role of course is not as revered or well-written quite frankly as the title role; however, this instance of gender-swap is lost in translation as Laws effuses a caricature of effeminate weakness incongruous with the position of authority and freedom of decision Ophelia would gain by being a man in her time. This is in part also due to the surrounding characters acting in protective, patronizing manners toward both Hamlet and Ophelia, regardless of gender. Whereas this fuels Hamlet’s passion, it serves to dull the gender-swapped Ophelia into submissive wispiness, marking Hamlet’s demise as catastrophic and Ophelia’s as shrug-worthy. Nevertheless, this “Hamlet” packs delight at every fast-paced corner. Callee Miles stands out as both an adoring Horatio and beautiful singer in the Hamlet Isn’t Dead live music band. James M. Armstrong is also delivering a whirlwind performance as the Ghost, Player, and Grave Digger, elucidating nimble swings between drama and comedy in an expert performance. Altogether this “Hamlet” rivets and thrills, and both flips of this cast guarantee vastly different and exciting perceptions and experiences of this classic tale in new breath. “Hamlet” is directed by James Rightmyer Jr. “Hamlet” stars Callee Miles, Cato Crumbley, David Andrew Laws, David Anthony Hentz, Don Meehan, Greg Pragel, Israel R. Hillery, James M. Armstrong, Kendra Lee Oberhauser, Megan Greener, and Rachel Black Spaulding. The design team includes Greg Pragel (Fight Director), Judy Kagel (Lighting Designer), and John Tamplin (Tech Director). 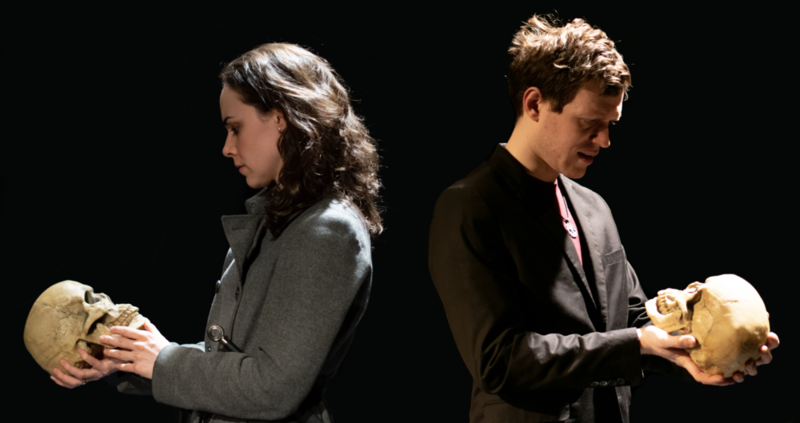 “Hamlet” runs at The Center at West Park’s Balcony Theater (165 West 86th Street, 2nd Floor, New York, NY 10024) through April 13, 2019. Tickets for “Hamlet” can be purchased online at hidham.eventbrite.com. For more information, please visit http://www.hamletisntdead.com. Running time is 2 hours with one intermission.